If you wish to buy our racehorse ownership as a gift, you can choose to buy a Gift Voucher (which allows your recipient to choose the racehorse themselves) or make a gift of specific racehorse(s), which we call Self Select. Once you have decided on a voucher or a specific racehorse, you can choose the type of Gift Pack you want. There are three options: An Electronic Gift Pack, a Postal Gift Pack or choose to receive no gift pack at all. *If you purchase a gift voucher these items are replaced with a booklet explaining how to choose a racehorse and redeem the voucher. The Electronic Gift Pack is for buyers who are under time constraints (so want their gift quickly) or are happy to print the details of their ownership gift on their own printer, or want to forward their gift by email. The pack is personalised and we generate them within 24 hours of purchase (although most are emailed within a couple of hours). *If you purchase a gift voucher these items are replaced with a document explaining how to choose a racehorse and redeem the voucher. Shareholders receiving the electronic pack can pick up their enamel Ownaracehorse badge when they first attend the races or a stable visit - it helps with identification at the racecourse. All our gift vouchers have a 'redeem by' date which is six months from the purchase date, but we are happy to extend this period if required, however you will usually need to call us once the six months has elapsed. An Ownaracehorse Gift Pack is just as thrilling for those with no knowledge of the sport as it is for confirmed horseracing enthusiasts. Our Racehorse Manager helps explain all the aspects of racehorse ownership. 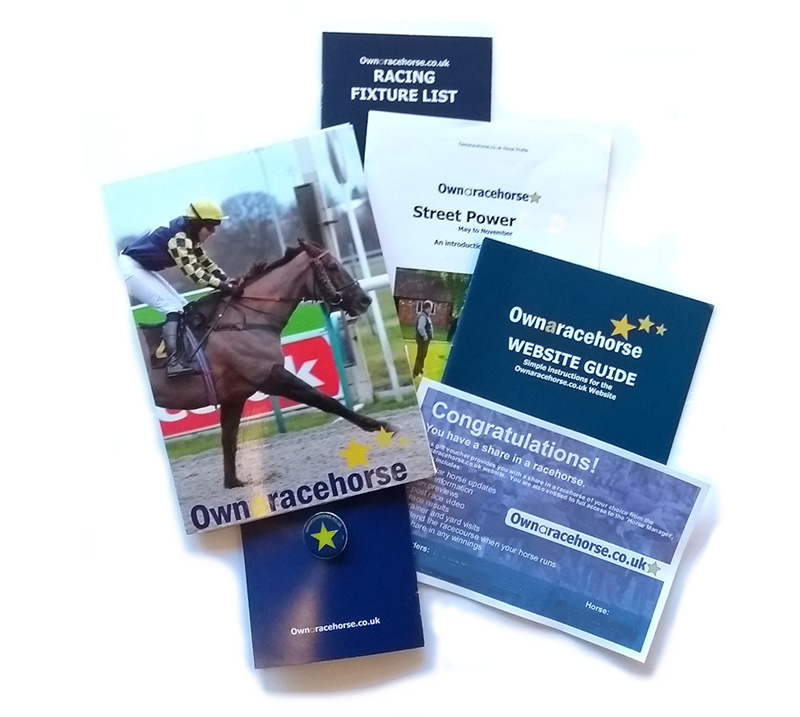 Within each gift pack we also provide easy to read information that someone new to the sport may need to get most from their racehorse experience, as well as the Ownaracehorse website. The Postal Gift Pack is made from strong card, and all the components sit in a purpose-built folder. The Pack is then placed in a Manilla board-backed envelope to ensure there will be no folding or creasing in transit. We do not place any branding on the outside of the envelope just in case your recipient happens to collect the mail - and you cannot see the contents through the envelope. The envelope is an outsized A5 and will fit through any standard letterbox. Wherever possible our Postal Gift Packs are despatched the next working day after purchase by First Class Royal Mail delivery. On average it will takes 2-3 days from purchase for your Gift Pack to arrive with yourself, or with your recipient if you choose to sent it direct to them. Your pack will not require to be signed for unless you choose the 'Next Day' option at checkout. The Electronic Gift Pack is sent via email to the address you provide when you purchase. It is sent as one or two PDF files. If we receive a bounce back we will endeavour to contact you, so its a good idea to provide a phone number when you buy - its the only reason we would use it. The pack is created and personalised by hand, so it can take up to one working day to send, especially if you purchase on a Saturday or Sunday, although we do manage to get most out within a few hours.